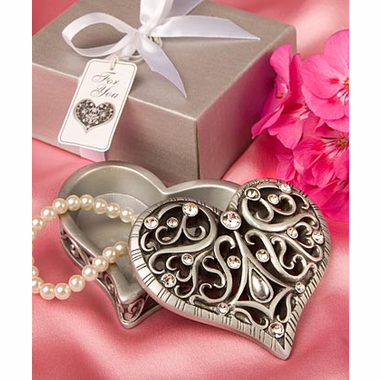 This precious heart shaped curio box is a favor that your guests will happily open up to! A lovely choice for wedding favors, baby and bridal showers, Sweet 16 parties, adult birthday parties, anniversary favors - so many uses! 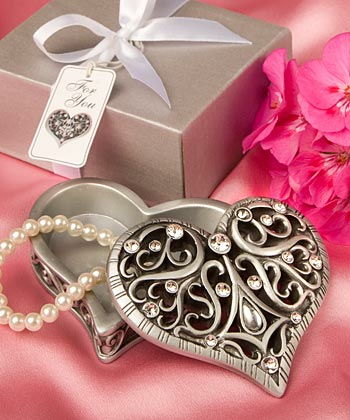 These heart design boxes are heartfelt treasures to behold! Each two piece heart shaped box measures 3? x 2 ?? and is made of pewter-colored poly resin with a removable lid and hollowed base, perfect for holding jewelry, coins and more. Both the lid and base are detailed in an intricate sculpted scroll design with glistening rhinestones in the lid. Each detailed heart shaped curio box favor comes delightfully packaged in a silver textured bow, tied with a white satin ribbon wrap and an attached matching heart design ?For You? tag.